The highly regular spirals of gaseous material surrounding the binary star system LL Pegasi. Astronomers recently peered deep into the perplexing structure of the two-star system LL Pegasi, revealing new details about its intricate spiral rings and how they formed. In 2010, the Hubble Space Telescope captured a remarkable photo of the system, whose spiraling structure scientists called "one of the most perfect geometrical forms created in space." The image showed the gaseous material of a forming nebula circling LL Pegasi and its younger companion star. "The spiral spans light-years and winds around with extraordinary regularity," they added in the statement. "Based on the expansion rate of the spiraling gas, astronomers estimate that a new 'layer' appears every 800 years — approximately the same time it takes for the two stars to complete one orbit around each other." LL Pegasi is a dying star in the process of shedding its outer layers in the constellation Pegasus. According to a statement from ALMA, the star is currently at least 200 times larger than the sun. ALMA captured the molecular gas surrounding LL Pegasi to form a "cube" of images; here, each frame reflects the gas with a given line-of-sight velocity (noted at the top right). 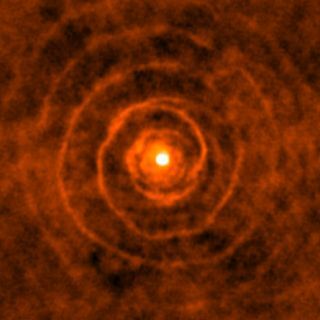 Using computer simulations, the study researchers also found that the stars have a "highly elliptical orbit," which leads to the observed "spiral-shell pattern" of gas material that is continuously ejected from LL Pegasi. "This unusually ordered system opens the door to understanding how the orbits of such systems evolve with time, since each winding of the spiral samples a different orbit in a different period," Mark Morris, co-author of the study and a researcher at the University of California, Los Angeles, said in the statement from ALMA. The new findings were detailed March 1 in the journal Nature Astronomy. LL Pegasi, as captured by the Hubble Space Telescope in 2010 (left), and the new ALMA image (right).